American cellist David Finckel and Taiwanese-American pianist Wu Han form a duo I first saw perform at the BDP Music Society, Preston, England during the 2003/04 season. This was whilst Finckel was still a member of the renowned Emerson Quartet. Since then I have seen the partnership several times, most recently at the Dresdner Musikfestspiele 2014. These are unquestionably dedicated chamber music performers who, I know, relish playing with and nurturing younger performers. In 1997 Finckel and Han founded their independent ArtistLed label. This new release, comprising four sonatas, marks the twentieth anniversary of ArtistLed. The chosen works for cello and piano from J.S. Bach, Mendelssohn, Debussy and Britten span a period of around two hundred and twenty years. Here Finckel is playing his Samuel Zygmuntowicz cello (Brooklyn NY, 1993) and Wu Han a Steinway Model D ‘Lorelei’. The earliest work on the album is J.S. Bach’s Sonata No. 1 for viola da gamba and harpsichord BWV 1027 which Finckel and Wu Han play on their usual cello and piano. The G major score is the first of Bach’s set of three viola da gamba works (BWV 1027–29) composed for Collegium Musicum concerts at Zimmermann’s coffeehouse, Leipzig. I must say that, although I prefer the work in its original guise, Finckel and Wu Han play their modern instruments intelligently with very impressive focus. Next is Mendelssohn’s Second Cello Sonata written in 1843 some five years after his First Cello Sonata. In this forceful and passionate work, the partnership provides a splendid interpretation notable for its stormy passion. Depressed by the slaughter of the Great War and battling against cancer, Debussy wrote his Cello Sonata in 1915 following a period when he found himself unable to compose. Finckel and Wu Han’s performance is entirely involving with the opening movement having a special quality. In 1960 Britten and Rostropovich met at the London première of Shostakovich’s First Cello Concerto in the presence of the great Soviet Russian composer. This resulted in Rostropovich commissioning Britten to write a Cello Sonata, premièred by Rostropovich and Britten the following year at the Aldeburgh Festival. 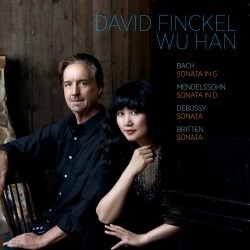 In this final work on this album Finckel and Wu Han are empathetic partners in this emotional roller-coaster ride, a sonata which deserves to be played more often in the recital hall. One feels that the partnership is completely at one with Britten’s writing of curious cold detachment. Grammy award-winning record producer and sound engineer, Da-Hong Seetoo has provided satisfying studio sound which has clarity, presence and satisfying balance. The accompanying booklet contains a short description of the works together with a note from David Finckel. I have the standard CD release but I notice that also available is a ‘PLUS edition’ which as well as the CD includes a USB drive, containing Audio re-mastered 2018 - MP3 and Wav file formats, audio notes and artist photos. These appear to be the same recordings that made up the complimentary CD that came with the May 2018 issue of The BBC Music Magazine; I don’t have the BBC Music Magazine CD so I can’t comment on its relative sound quality. Throughout these four sonatas, each requiring different interpretational approaches, Finckel’s performance has style and strong conviction and with Wu Han’s incisive playing the end result is entirely persuasive, generating considerable drama.